February 14, 2010 – It’s believed that on Wednesday night, Colton Harris-Moore stole his fourth aircraft, a Cirrus SR22. The Cirrus SR22 appeared on radar at 11:30 PM skirting the restricted airspace set up for the Vancouver Winter Olympics. The aircraft was stolen from an airport in Skagit County. At that time FAA personnel didn’t realize the aircraft was stolen however the FAA kept a close eye due to its location and the aircraft was squawking the wrong transponder code for approaching the restricted airspace. About 11:45 PM, the FAA lost contact with the Cirrus SR22 aircraft after it dropped from radar near Orcas Island. Under further investigation on Thursday the local sheriff learned about the stolen aircraft and that a local grocery store, the Homegrown Market, had been broken into. Missing was $1,200 taken in cash, the dessert tray was cleaned out, a camera surveillance system was destroyed and drawings of a chalk outline of feet were made all over the floor suggesting "the Barefoot Burglar", Colton Harris-Moore. September 29, 2009, a Cessna 182-T airplane, registration N2183P, was stolen from its owner's locked hangar in Bonners Ferry, Ohio. The airplane was located two days later in Granite Falls, Washington. The aircraft had been flown and landed with sustained substantial damage to the fuselage. Colton Harris-Moore, born March 22, 1991, 18 years of age, 6’5”, 210 pounds, better known as Colt, grew up in a mobile home in an isolated area of Camano Island, located in the state of Washington. At age two his biological father left the home and at age 7 his stepfather died. It was reported the stepfather was physically and emotional abusive and on one occasion his stepfather choked him during an argument at a family barbecue. This young man had great difficulties in the public school setting; he would not listen to his teachers and was involved in numerous altercations at school. At age 8, Colton began his stealing spree, starting off with a bicycle and then graduating to stealing cars and breaking into homes and businesses. Each time he was given a warning by local police. However, at age 12, Colton was convicted for the first time for the possession of stolen property and served 3 months in detention. By age 13, he Colton had three more convictions. In 2007, Colton was convicted and sentenced to 3 years in a juvenile detention center. However, Colton was later transferred to a halfway house because of good behavior. In 2008, while serving time in the halfway home, Colton Harris-Moore escaped out a second story window. At bed-check he was in his pajamas and when the counselors left to do further rounds in the building, Colton climbed out a second story window and has been on the run ever since and had begun his infamous run with the law. It has been alleged that Harris-Moore has burglarized over 100 businesses and homes throughout Washington, Idaho and Canada. 50 of the break-ins occurred since his escape in 2008. His mother, Pam Kohler, has stated, "Every time he had anything any good, everyone thought he stole it..," "What does that do to a kid?" Police now allege he has graduated to stealing aircraft, although he has never taken flying lessons. In November 2008, police believe the young man ordered a flight manual on the internet and then stole a Cessna aircraft. The aircraft was crashed landed 300 miles east of the island on an Indian reservation. Since then police believe he is also responsible for stealing two other aircraft. On Fox News, Harris-Moore's mother Pam Kohler stated in an interview, "I hope to hell he stole those airplanes. I'd be so proud. But put in there that I want him to wear a parachute next time." Camano Island is an island nestled in Puget Sound, it is located in the state of Washington. 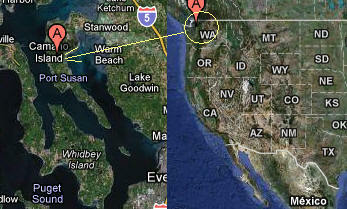 It’s about 25 miles north of Seattle and 120 miles south of Vancouver, Canada. Its population is just over 13,358 permanent residents as of the 2000 census. There are a handful of country style grocery stores and restaurants. Camano was first settled by the Native Americans Indians. The island takes its name from an early Spanish explorer, Jacinto Caamaño. The island gets its revenue from tourism (17,000 tourists a year), shipbuilding, light manufacturing and fishing. According to Camano Island trends data, the number of jobs on Camano Island has decreased by 23% since June 2008. Camano Island's job listings indicate that the Island hires mostly workers in Misc Store Retailers, Food Service Contractors, Catering Services, Pet Care Services and Industrial Process Instruments Mfg. Colton Harris-Moore has been turned into folklore in the Pacific Northwest. You can find T-shirts bearing his face and or the words "Fly, Colton, fly" and "Momma Tried" are now big sellers in Washington and on the internet. Colton has been decrypted as the "the Barefoot Burglar" for the reason that he once kicked off his shoes to flee deputies chasing him in the woods. Colton’s story can be found on the internet at such places as Youtube and Facebook, with a huge fan club throughout the United States and worldwide. Colton has over 18,000 followers on Facebook. There are many who are cheering this fugitive on. “Have fun while you can.... be careful.. be smart. Fly south”, “He’s Back!!! Atta boy Colt!”, “Fly Colton, Fly!”, “I think we should all name our children Colton”, “You are are legend Dude! Continue to do what you do best! Rock n' Roll”, “U go Barefoot Burglar!!! !”, “Colton, thank you for not conforming to society's norms and for making me laugh! I wish I had the guts, knowledge, and aptitude to live like you do, never harming anyone, never getting caught”. Some of the townspeople are suggesting that his stealing spree is not for the money but just to survive in the woods. It has been alleged that he broke into a home, used the homeowner’s computer and credit card and ordered bear, mace and a pair of $6,500 night vision goggles. Colton Harris-Moore continues to be on the run. At his mother’s trailer home, Colton escaped from a police raid. But before running he managed to leave a note behind which stated, "Cops wanna play huh!? Well its no lil game.....It's war! And tell them that." The Camano Island police reported that during that same incident Colton backtracked to his mother’s home. Unknown to them, while they continued with their investigation, Colton went into a deputy's car and stole an assault rifle. Island County Sheriff Mark Brown blew up at a “Today” show producer who asked him about the made for Hollywood aspect of the story. The sheriff stated, "He is an adult felon! I will not have him made into some kind of folk hero." Colton Harris-Moore's mother reports she does not know where he is and believes he is staying with people who are providing him with a safe house(s).